We’re still at least a few months away from the official release of Microsoft’s SQL Server 2016. So far we only have rumors to work with, but there is quite a bit to be excited about for those interested in information technology, database management, and networking. If you have an Azure account, Microsoft offers a Virtual Machine with SQL Server 2016 pre-installed for a test drive. Otherwise, you can download the Community Technology Preview 3.2 at the Microsoft Evaluation Center. The last official posting from Microsoft was on January 29 though several new bug fixes and patches are in development. The mechanisms for gathering statistics are improving and can be updated automatically. Stretch databases have been enhanced extensively, with stronger encryption support and migration fixes. The Enable Database for Stretch Wizard has also been retooled to reduce the learning curve for those unfamiliar with database management, creation, or migration. Fixes to the SERVERPROPERTY have been implemented and foreign key relationship limits increased. You can find a full list of updates, patches, and fixes on Microsoft’s SQL Server 2016 forum. A few Reporting Services web portal is available that incorporates KPI’s, Mobile Reports, and Paginated Reports. It does take some effort to customize reports, but the default GUI is cleaner and more intuitive than Microsoft’s typical feature set. The SaaS and cloud-based focus of the company becomes clearer when using SQL Server 2016. Integration with all Microsoft products across all platforms is the ultimate benefit of utilizing SQL Server, and upgrading to 2016 is made as easy as possible through Microsoft’s Azure service. Users familiar with WordPress, Google Analytics, and SalesForce will feel comfortable navigating SQL Server 2016 with minimal struggles. As always, integration with PowerPoint, Excel, and other Office products is embedded and is much more improved since the shift to a Google Docs-style Office model. Microsoft is trying to remove the burden on CPUs and servers by prioritizing heavy loads. A new HTML5 rendering engine targets modern web standards and browsers much more efficiently than previous versions. PDF has replaced ActiveX for remote printing, which reduces print times on large projects significantly. Manufacturing and other large-print businesses will see an improvement in efficiency with SQL Server 2016. The report builder, which is core to the SQL Server interface, has been tweaked. The GUI was streamlined, given a modern makeover and is much easier to navigate. Creating reports is a breeze, and keyboard shortcuts still work in the newer version. Importing queries, databases, and reports from previous versions is easy; and SSRS supports .NET framework 4, along with High DPI. With these changes alone, SQL Server users are rejoicing at the ease of use. As mentioned earlier, installing a new print server no longer requires ActiveX, and PDFs are much easier to move between devices and printers. Moving between native and SharePoint mode is simple, and the foundational platform supports nearly every business application. Pointing proprietary software applications to the newer version should be seamless in both small business and enterprise applications. Regardless of whether in SharePoint or Native mode, Reporting Services Subscription updates will make any power user happy. Customizing, enabling, disabling and assigning subscriptions is easy; ownership is easily transferrable as well. Credentials can also be shared across devices to personalize the cloud. Both consumers and enterprise users will notice a much smoother web and user interface when more, larger systems migrate to SQL Server 2016. 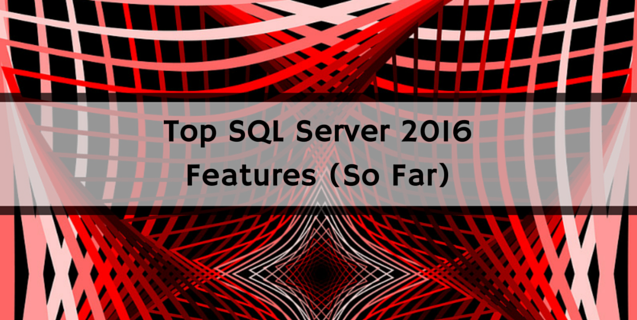 To learn more about SQL Server 2016 features, contact ONLC Training Centers today. Microsoft System Center – What’s New?